On September 4, the final day of New Student Orientation Week, new and returning Johnston Center for Integrative Studies students gathered in the lobby of Bekins-Holt Hall for a Johnston history brunch. Touching on a range of subjects including the original Johnston College and the personal experiences of faculty members, Johnston Center Professors emeriti Bill McDonald and Yash Owada answered questions from the student audience. What led to the founding of the Johnston College? Bill McDonald: In the mid-sixties, University of Redlands administrators decided that the University needed to expand. Wanting to use the Claremont model, where several colleges are grouped into one consortium, there was a thought of a law school, and then a desire for a school of international business. George Armacost, who was president of the University at the time, decided he would start with that. He hired Pressley McCoy, who had been working for the Danforth Foundation, to be the chancellor of the new college. Armacost gave McCoy free reign over the college and curriculum. McCoy ended up having quite a few different ideas on how education in America should be structured, and that’s how Johnston College was formed! How did James Graham Johnston get involved? McDonald: The faculty members of the new college met with University trustee Dwayne Orton, the director of education for IBM. He worked with a man named James Graham Johnston, an IBM executive, who wanted to donate some of his money to an organization that would preserve his name and make some difference in the world. 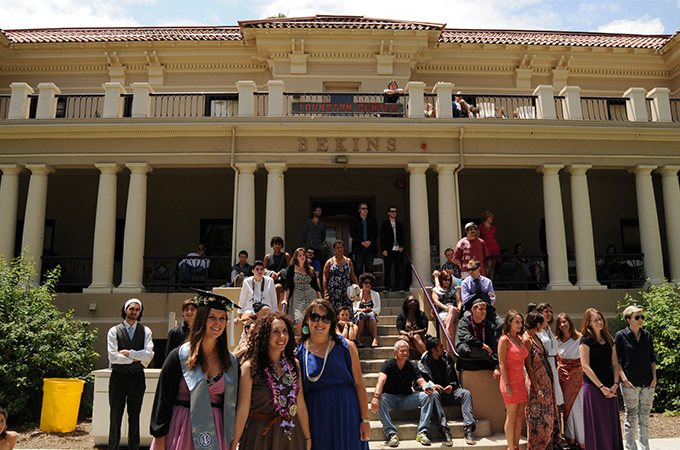 He wasn’t particularly interested in education, but because he was a friend of Dwayne Orton, Johnston was brought to the University of Redlands. Johnston’s monetary donation coincided with Armacost’s plan to expand the University, and so $1.8 million was given to the new school, which was initially designed by Armacost to focus on international business. Jimmie Johnston came to the Johnston college's official dedication in 1971, his only visit to the campus. How was the original structure of Johnston classes formed? McDonald: Pressley McCoy was actually going through some marital issues, and he and his wife were in therapy together. They eventually found themselves in a training group, or “T-group,” which was an exercise devised by NASA. The groups weren’t therapeutic by design—they were created to help international scientists, who came to work for NASA across different cultures and language barriers, work better in teams. In T-groups, the only subject of conversation is a person’s immediate reaction to another person. Members respond to others in a noncritical way, which creates intimacy among the group members. McCoy brought this idea back to campus and started hiring a group of faculty members. Seven of the original faculty members were under 30 years old, and there were about 180 Johnston students in the program’s first year. All the faculty members and students went up to Pilgrim Pines, a campground in the mountains, and engaged in T-group training for 10 days. Simultaneously faculty members began planning the curriculum with the students, and the T-groups provided a fresh model for operating the academic seminars. The seminars and tutorials were also based on "contracts" negotiated between faculty and students, as were, ultimately, the terms of each student's graduation. That basic academic structure hasn't changed over Johnston's 48 years, arguably making it the most conservative academic program on the campus. In the first few years of the Johnston Center, how many students were there, and how did they hear about the program? McDonald: In 1971, our first graduating class had eight people in it. It wasn’t hard for students to find out about Johnston because that sort of student-guided education was catching fire across the country. About 40 institutions in the U.S. had programs like Johnston at the time—only about 12 of those programs have survived. The University's student dress code at that time was quite formal and conservative, especially for women; the clash with counterculture Johnston students' apparel was pretty dramatic. The counterculture, quite literally, was Johnston. Yash Owada: I think a big reason why students kept applying to Johnston was because of an article in Time magazine. It was a very powerful magazine at the time and had a short column about what was happening in education that one week featured Johnston College. I think a lot of students were attracted and impacted by that article and other reports on the beginnings of Johnston. How did the College of Arts and Sciences students and faculty view the Johnston students and faculty? McDonald: Currently, the differences between schools and programs at the University are healthy—but back then, it was a war. It was a profound culture clash. Additionally, the Johnston faculty members were politically stupid, because we didn’t make alliances with other University faculty members. We missed a lot of chances that might have influenced the program later on. 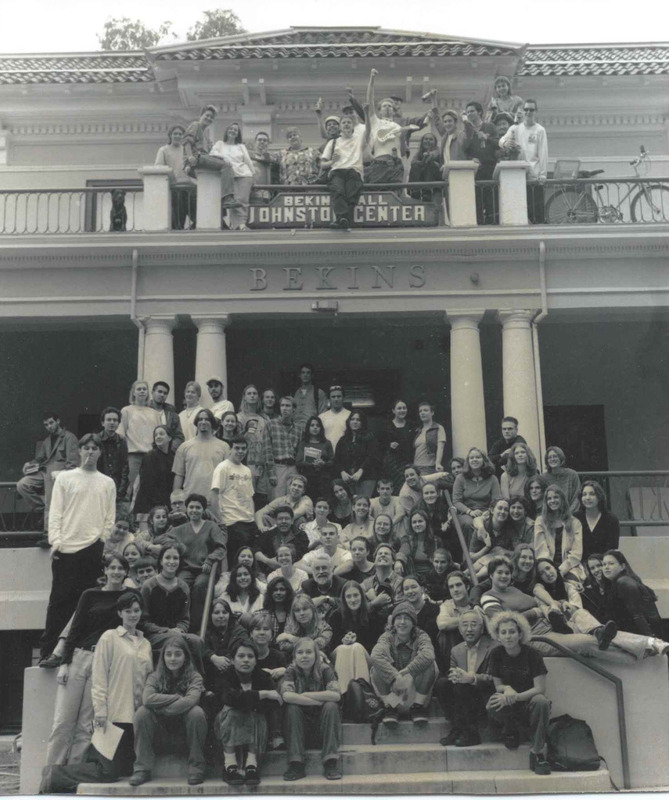 Members of the Johnston Center for Integrative Studies on the steps of Bekins Hall in 1997. Can you talk about the transition from Johnston College to the Johnston Center? McDonald: The University founded Johnston College as a separate entity, with a separate board and academic accreditation, both of which were always celebrated by everyone on campus. The conflict between the University and Johnston was always over money and student life. Johnston itself was being charged for use of the library and athletics. We paid our own way for about five years until enrollment began to decrease. In the end, we just could not support ourselves. In 1979 the University probably would have gotten rid of Johnston altogether had it not been for U.S. News and World Report. The entire paragraph on the U of R in the report was exclusively about Johnston, so they kept the program. Have you noticed any similar personalities that have come through the Johnston Center over the years? Owada: There may be some commonalities among students, but they are all unique individuals. What I end up seeing more often is students’ willingness to take risks. I think those are just the kind of students we attract. McDonald: It’s possible that current students can remind me of past students from the '70s or '80s, but I don’t like to think that way—because I would never see the individual. What’s your favorite memory from your time in Johnston? Owada: As director of the Center, it was a part of my role to read admissions applications. Of particular interest to me was to read the personal essay part—dozens and hundreds of them in any given year. A lot of repetition, but once in a while there was a shooting star. There was a woman applicant who described the image of the education she sought through Johnston as follows: "I am standing on a cliff. I spread my arms, and jump off the cliff. As I fly, I think of the kind of education I want, what and how I want to study. I want a college that allows me to do that." As Johnston director, I wanted her to come to Johnston very badly, for I wanted to tell her that at the bottom that cliff was a Johnston professor with her/his arms open, receiving her as she came down." That's how Johnston education worked. McDonald: One of the original faculty members was Jeanne Friedman, a radical activist with a Ph.D. from Stanford. Just before she was hired by Pressley McCoy, she’d been arrested for criminal trespass at the Stanford Research Institute, which was connected to the Vietnam War at the time. She was guilty, but had not yet been convicted. Redlands was an even more conservative town then than it is now, and someone heard about Jeanne’s background and told the Redlands Daily Facts. When George Armacost read the article, he called a committee crisis meeting with the Johnston faculty regarding Friedman’s employment. It was a very tense meeting where Armacost demanded that Friedman be fired, but McCoy responded, “If she goes, I go.” After that, Armacost backed down and Jeanne stayed. What is the most impactful thing that you’ve seen this community do? Owada: The community meetings are some of the strongest forces within Johnston. Sometimes there are only 10 students, and sometimes there are all 100 or so of them. Fundamentally, there is a notion that everyone shares here, and all the important decisions are being made for the good of the community. That’s the most impactful thing for me. McDonald: Almost 20 years ago, there were three successive years in which one sexual violence attack occurred within the center each year. It was a terrible crisis, especially with people living together and the “he said, she said” arguments. We were able to sit down with those people and really work through it emotionally. It showed me that Johnston is a very strong community, and I feel lucky to be a part of it.